Phi Phi Island monkeys add to the overall Phi Phi fun for the entire family. Who does not enjoy watching playful monkeys? Kids delight in watching the monkeys and you can expect to see monkeys all over the island and on the beach. Many visitors marvel at how the monkeys are so confident in front of their human cousins on the beach and throughout the island. You will want to keep your camera ready as these fun ancestors can create the perfect photo opportunity when you least expect it. Please keep a safe distance especially in low season as the monkeys are used to being fed especially by the guides who offer cheap sweet bananas to the families of monkeys that visit the beaches. If you are on the beach and you have food with you make sure you keep a watchful eye on it, but if you stray too far away you may not get back in time before a monkey or two partakes in your meal.!!! Monkeys are no there all day and tend to arrive on the beaches in the afternoon as it starts to cool . If you are skittish of monkeys you will want to keep that in mind and you can ask the hotel or resort you are staying at which beaches are the best for you to visit. 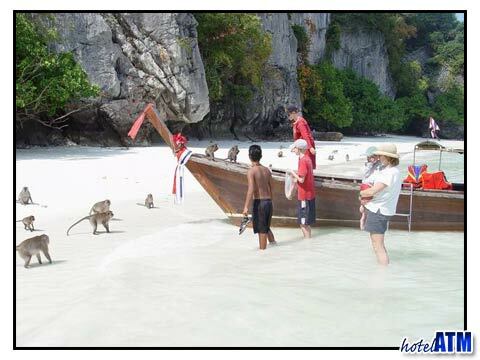 Most of the monkeys are on the thin beaches of Hao Ragoate on Phi Phi Don and Yung Gassem now called Monkey beach. There are no monkeys on Phi Phi Ley. For the most part you have nothing to worry about but you will want to explain to small children that they need to be careful. What the child can think is playing a monkey may mistake for an act of aggression. Very few problems have ever been reported on the island but you still want to be aware of these things. If you feel unsafe you should leave wherever you are and head back to the boat and out to sea. Again, it is extremely rare that anyone has a problem but just in case you will want to make sure you always protect yourself, your family and your possessions. Do not leave clothing unguarded that contains valuable documents or other objects including passports, cell phones, wallets, etc. Some times the monkeys are curious of shiny objects The more careful you are and the better you protect yourself the less likely you will be to have any issues with the fun and delightful monkeys on Phi Phi Island.